From wherever you are, Weatherford is worth the trip! A historic town that's just 20 minutes west of the Dallas/Fort Worth Metroplex, but it's like stepping back years in time. 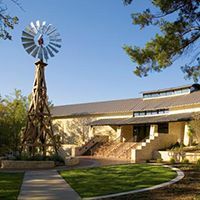 Whether you come for an afternoon, a day or two, it's easy to see why Weatherford has become a draw for history buffs, western lifestyle enthusiasts and those with a pioneer spirit. 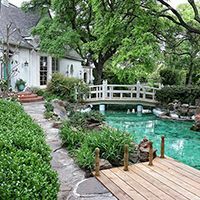 Clark Gardens Botanical Park awakens your senses to the natural wonders of Texas. Clark Gardens began in 1977 and opened to the public in 2000, as the personal dream of Max and Billie Clark. Open daily, year-round, visitors can wade through a sea of rainbow-hued iris, relax in the perfumed shade of a rose arbor, or stroll along the flower-laden banks of a sun dappled pond. 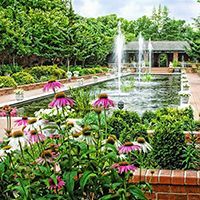 By using Texas adaptive plants and through an extensive system of conserving and collecting water Clark Gardens hopes to inspire and educate those that visit. For the train enthusiasts, the Clark Gardens G-Scale model gardens trains are a must see. Replicating the historic rail system that ran through this area, garden trains meander on 1200 feet of track through miniature dioramas of historic towns. The Historic Tree Trail contains over 75 different historical trees each telling a story from a famous place or famous person in American History. The trees are the genuine offspring of the original historical trees the bore witness to the lives and events that shaped our nation. Each tree was grown from the seed or cutting of the actual historical tree and has a certificate of authenticity. The Park purchased the trees from American Forest's Historic Tree Nursery, which has been protecting, preserving and propagating historic trees since 1875. 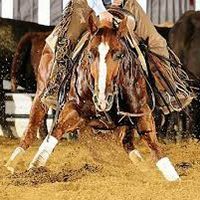 Proximity to the National Cutting Horse Association headquarters and major events has made Weatherford the Cutting Horse Capital of the World. Weatherford is home to dozens of Hall of Fame trainers, hundreds of the best horses in the industry and one life-size bronze cutting horse that graces the lawn of the Weatherford Chamber of Commerce. Thanks to the horse industry, there are also plenty of shops for those looking for western wear or tack. If you want to see what cutting is all about, you can catch a show on most weekends at Weatherford's Silverado on the Brazos. The Doss Heritage & Culture Center highlights Parker County's rich tapestry of cattle barons and cowboys, Broadway stars, artist and political leaders will all showcased in the new exhibit spaces. 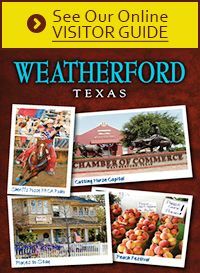 Visitors to Weatherford will enjoy many treasures. Our Historic Shopping District is full of antique, boutique and specialty stores. Many specialize in western memorabilia and rustic, ranch-style furniture. 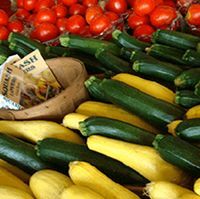 There's also an old-time Farmer's Market downtown, where you can buy fresh Parker County produce, including watermelon, pecans and of course our famous peaches. The crown jewel of the downtown is the Parker County Courthouse, recently restored to its original splendor. 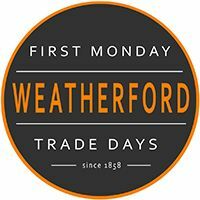 If it's wheelin' and dealin' you desire, then be sure and plan your trip during Weatherford's First Monday Trade Days, always held the Friday, Saturday, and Sunday before the first Monday in each month. There is a farm and ranch lot with critters, food, items for in the home as well as lots of items for use and decoration outside. Visit the First Monday Trade Days page for more visitor and vendor information. Take a driving tour to see Weatherford's bounty of Historic Homes. A variety of architectural styles are represented including Victorian, Queen Anne, and Greek Revival. See the home where Broadway star Mary Martin was born, where her son Larry Hagman, who played J.R. Ewing on the TV show "Dallas," grew up, and where former U.S. Speaker of the House Jim Wright spent his boyhood days. Be sure and visit Greenwood Cemetery, where famed cattle drover Oliver Loving is buried. After being attacked by Indians in New Mexico in 1867, Loving's dying wish to his friend, Charles Goodnight, was to be buried in his home, Parker County. Goodnight brought the body back 600 miles by wagon for burial. If this story sounds familiar, it should. It is the inspiration behind Texas author Larry McMurtry's novel, Lonesome Dove. 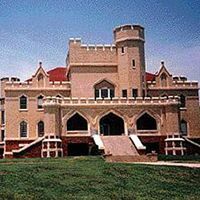 You'll also see the Pythian Home, Weatherford's own "Castle on the Hill" that was built in 1909 by the Knights of Pythias as a home for widows and orphans. Today it serves as a foster home for children of families in need. 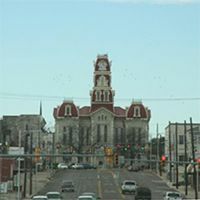 Located in historic downtown Weatherford, the Museum features the rich heritage and living traditions of indigenous peoples from Native America, Mexico, and Latin America. Discover how the Eskimos of Alaska and Canada developed crafts and a way of life very different from the tribes of the Amazon; or how the Plains Indians followed the buffalo while the Aztecs built great civilizations. The Museum offers hundreds of artifacts, masks, ceramics, costumes, toys and more, of interest to people of all ages. 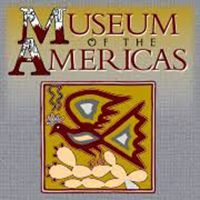 Learn more about the Museum of the Americas. Rails-to-Trails is a 26-mile trail-way that can be explored by foot, bicycle or horseback. You can enjoy the wildlife along the trail as it winds through the countryside all the way from Weatherford to Mineral Wells. 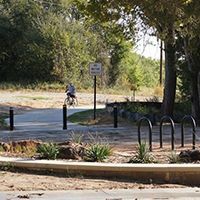 Town Creek Hike and Bike Trail is a favorite for residents and visitors. The 3.2 miles of trail way begins at the Weatherford Chamber of Commerce, runs along Santa Fe Drive and the First Monday Grounds, connecting with a second trailhead at the Weatherford Police Department. From there, the trail leads in two additional trails. One leg heads east, crosses Town Creek, and ends at Boise Ikard Elementary School. The other leg makes its way along the east side of Eureka Street and connects with Holland Lake Park. Golf enthusiasts will love Weatherford's scenic and challenging public courses. Finally, for water lovers, there's Lake Weatherford, perfect for boating or fishing.